I have a very exciting monthly update for you. 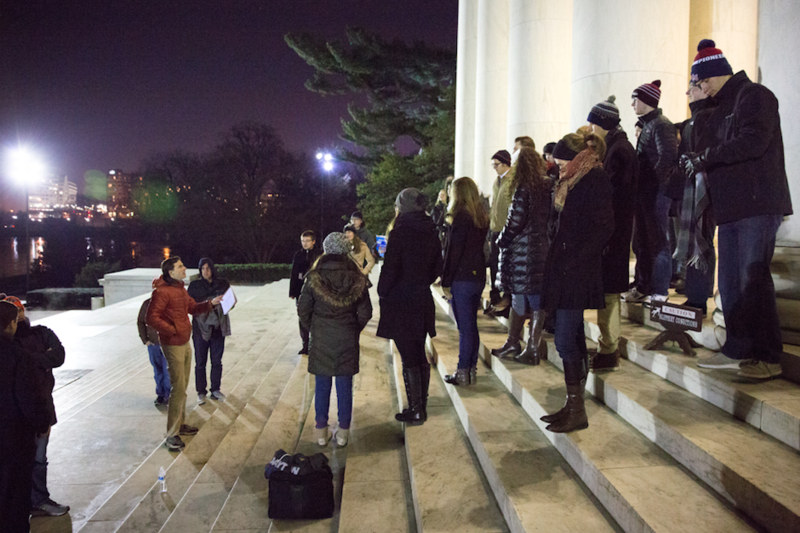 January is one of the highlights of the Forge Year because of Forge 201, held in our Nation’s Capital right after New Year’s Day. 25 students in the Forge Mentorship Academy and 5 volunteers and staff joined us January 2-6, 2017 for an incredible 5 days in Washington. What is the Forge Mentorship Academy? The Forge Mentorship Academy is a year-long program offering experiential learning in national and international politics, training in argumentation and current events, an individualized mentor match, and connections to top internships and jobs. Designed to supplement full-time studies or employment, the Academy admits standout graduates of the Forge Leadership Summit. Forge facilitates the Mentorship Academy through digital mediums, conference calls, and trips to Washington D.C. and Israel. Through each platform, Forge provides unique access to renowned thought leaders and power players of the conservative movement. Forge provides tailored career and personal development by matching each student with a field-specific mentor. Through this year of dynamic training, students create deep relationships with like-minded peers and mentors from around the country, building lasting networks for years to come. Students gather twice during their time in the Mentorship Academy, once in D.C. in early January for Forge 201 and once at the start of summer for Forge 301 in Israel through our partner Passages Israel. Students encounter national policy and politics firsthand at Forge 201. During their four days in DC, students interact with the political process from 360 degrees, meeting with Congressmen, staffers, advocacy groups, cultural leaders, think tank scholars, pastors, and journalists. 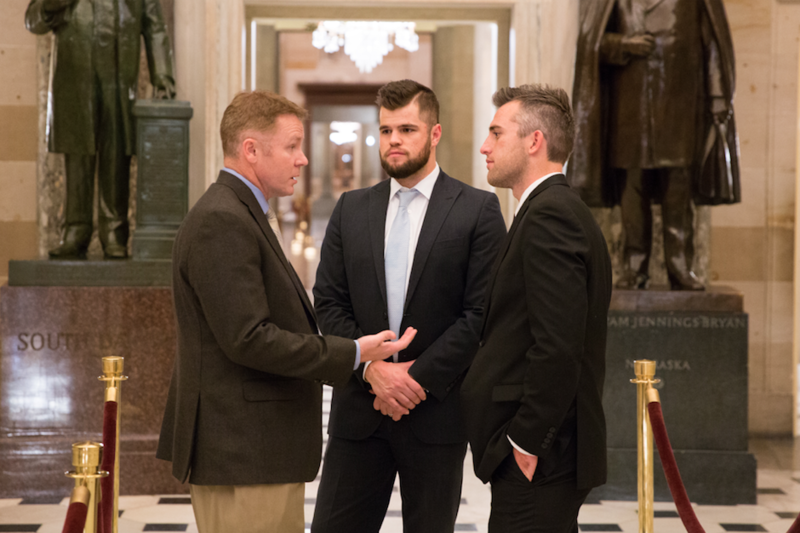 Students discuss principles and process during intimate roundtables with leaders from the Heritage Foundation, Alliance Defending Freedom, the Ethics and Religious LIberty Commission, and more. Evening activities include a majestic nighttime monument tour with a focus on the character and leadership of each Founder, and a private, after-hours tour of the U.S. Capitol led by Congressmen and their staffs. This year was our second annual Forge 201 in D.C.
Last year, Forge 201 was only 3.5 days. This year we added a day in order to incorporate more speakers and a visit to The White House, Supreme Court, and Library of Congress. Tuesday Night January 2nd was opening night, and it’s a special time because unlike Forge 101 in Columbus, Forge 201’s first day is a bit of a reunion for these students, who are no longer strangers slightly intimidated by a new program. They’re now friends who have been through the Summit, on conference calls, email threads, and social media discussions and conversations together. But they live and go to school all over the states, so six months after the Forge Leadership Summit (Forge 101), this is their first chance to all meet up again. Justin and I introduced Forge 201 as unlocking the questions of the “Why”and the “How” behind the “What” of what goes on in D.C. in the federal government that we read about on the news, Politico, and more. We heard two great talks that evening – Dr. Paul Coyer enlightened us about the impact that religion has on geopolitics, and Paul Teller advised the students on “How to Make It In D.C. As A Conservative” and shared his own journey, which currently has him working in a specially created role as Special Assistant to The President in Legislative Affairs as the liaison to conservative Representatives and Senators and the entire conservative movement. The theme of Wednesday was the judiciary and the role of law in our republic. We spent a wonderful entire morning with our friends at Alliance Defending Freedom. We heard from attorneys who have argued before the Supreme Court, free speech experts, coalition builders, and learned about the Masterpiece Cakeshop case that will be decided this summer and have big ramifications on religious liberty (ADF attorneys represented Jack Phillips and delivered the oral arguments last month before SCOTUS). We then toured the Supreme Court, sitting in the chamber, hearing from an expert guide on the history of the Court and the intricacies of what goes in the Chamber. Each year, there’s always a number of Forge Mentorship Academy members very interested in law school and different forms of the practice of law, including constitutional law; Wednesday was a real highlight for them, especially. We switched it up a bit Wednesday evening and were hosted by the Ethics and Religious Liberty Commission, a unique organization in that they are a public policy and lobbying arm of an entire Christian denomination (the Southern Baptist Convention). Forge students hail from many different denominations, so we had a discussion of the intersection of faith and politics, and distinctions in how conservative Christians have engaged culture and American politics throughout the last few generations. One of the real highlights and exclusive experiences of Forge 201 that our students won’t find anywhere else happened Wednesday night. Our good friend, Congressman Warren Davidson, flew in from D.C. in order to give an incredible personal tour of the Capitol. Unbelievably generous! Congressman Davidson and two of his staffers toured us around the rotunda, the Statuary Hall, and even took us on the House Floor (where the House votes and where you saw everyone this week for the State of The Union) and the Speaker’s Balcony (near where every new president gives the inaugural address). Really a “Bucket-List” item or our students! Thursday January 4th was snowy, but we persevered, spending the morning hearing from wonderful exprts at The Heritage Foundation about hot button issues like tax reform, trade and economic policy, religious liberty and more. We then spent an afternoon on Capitol Hill, hearing from Congressman Meadows, two congressional Chiefs of Staff and a 4 different staffers who work in different areas, offices, and committees on The Hill. This gave our students a wonderful taste of the diversity and nature of the opportunities available when working on the Hilll or in Legislative Politics in general. Friday began with a tour of the While House East Wing. This is a self-guided tour through the East Wing of the White House. It did not disappoint, bringing so many historic images of famous presidents to memory. We then went to the Library of Congress. 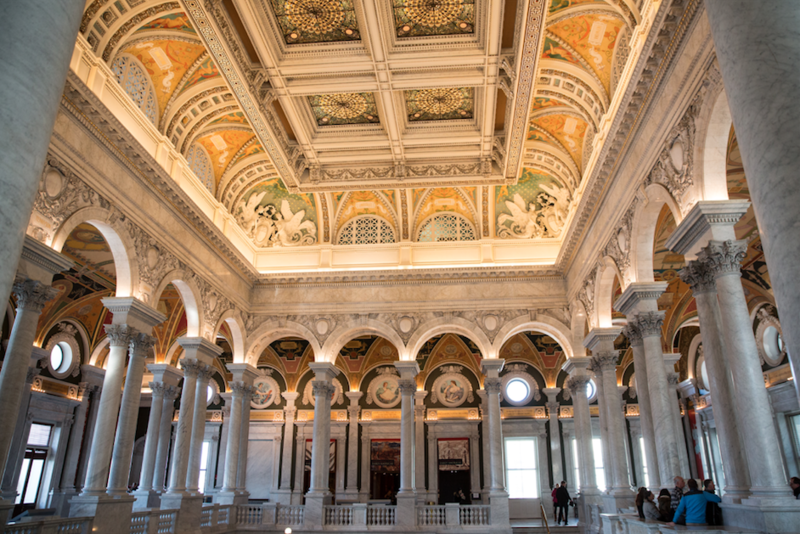 Words don’t do the Library of Congress’s beauty justice. Take a look at the pictures to see the majesty. 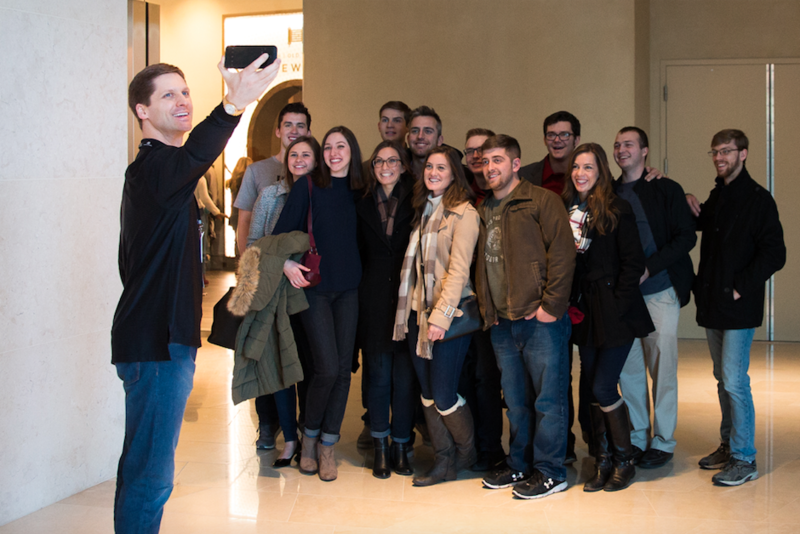 A key part of Forge is helping our young conservatives envision their future. As part of expanding their networks, our Friday night dinner allowed students to share a meal in a small group setting with an expert guest who was in a field or role they are interested in. We had experts from careers in legislative politics, interest groups/outside organizations, and media and journalism. This gives our students a real way to break bread (or Chicken and Waffles as it was in this case) with folks who might be potential mentors, advisors, even bosses (as we’ve already seen occur)! Saturday was our final day, and we ended with a look toward the future. Quite literally… our speaker Nathan Hitchen introduced our students to the concept of futurism. He taught them how to think ahead and analyze trends and possibilities to strategically anticipate what’s coming next. We ended with the Museum of the Bible. Our good friend Ryan Smith, who works in the Office of the President of the Museum, sacrificed his Saturday to take us on a VIP tour. It’s simply hard to put into words the impressiveness of the museum. It’s unlike any museum I’ve ever visited; incredibly interactive, exciting, and inspiring. There’s enough material in there to take 72 hours to see everything. It’s the most technologically advanced museum in the world, and you can download a tour personalized to your preferences on your iPhone! The visit to the Museum of the Bible also serves as a wonderful segway to the Forge students’ trip to Israel in late May! I hope you enjoyed this recap of Forge 201 and how the photo gallery really brings it to life. Your support and partnership makes these amazing experiences possible for our students! Thank You! Like I started in December, I want to commit this year to making sure that I invite you to participate in your ministry in every way you might feel led. To that end, each month I’m going to list some ways you can engage in praying, sharing, giving, and serving. Please pray that God would bring the right mentors to mind as we carefully match each of the 25 Mentorship Academy students to their individual mentor here in the next few weeks. Please join us in praying that student recruitment for 2018 would exceed even our highest hopes; that God would bring incredible young conservatives to apply for the 2018 Forge Leadership Summit; and that their busy schedules with internships, summer jobs, friends’ weddings, summer vacations, etc. would open up July 24-28 to allow them to take part in our life-changing program. Would you like to take a next step in giving in 2018? I’d love to talk to you about that! Would you like to be considered as a Forge mentor for a Forge student who has high hopes in your profession? Please let me know if you’d like to be in the Forge Mentor Database, and I can send you the mentor relationship expectations so you can evaluate the time commitment, requirements, and opportunities. Application to the 2018 Forge Leadership Summit is now OPEN. Now is a great time to spread the word to young conservatives or any networks (educators, organizations, young professionals, college groups, etc) about the 2018 Leadership Summit, held July 24-28, 2018 in Central Ohio. Conservatives ages 18-25 who want to impact culture, politics, business, and more should apply today at forgeleadership.org. The earlier they apply, the more money they save on Leadership Summit tuition with substantial Early-Bird Discounts! This is a great page to share or send people to: forgeleadership.org/leadership-summit/. Of course, you’re always welcome to connect me to then directly via phone or email! Happy February! Thank YOU For Allowing Me To Serve This Ministry! P.S. Did you know we recently helped a Forge student land a prestigious White House Internship? Very rare for a college sophomore – but God used the power of the Forge networks to make it possible! Adam is passionate about investing his future in the future of students who will become the next innovators in the marketplace, champions of free enterprise, inspiring educators, shapers of culture, and statesmen and stateswomen in government.